Add some drama to your dining room with the contemporary Benecio dining chair. Finished with a durable and easy-to-clean 100% polyester fabric cover, this upholstered chair has a rich, velvety feel that adds a sophisticated twist to your home furnishings. Featuring a sleek ribbed design and clear acrylic legs, this comfortable chair has a modern feel with standout style. The timeless and neutral grey colour is a fashionable way of updating any dining space and blends easily with existing decor. Group multiple Benecio dining chairs around a table to create an elegant dining set, place them individually around your home as accent pieces, or use for extra seating when entertaining. This attractive and versatile chair makes a chic addition to any living space. Add some visual interest and comfortable seating to your home with the stylish Avery side chair. The sturdy rubber wood construction and webbing seat structure of this chair stands up to regular use with ease and the blue, 100% polyester fabric is as practical as it is eye-catching. Accented with a classic nail-head trim for durability and style, this chic chair makes an elegant complement to any dining room, living room or study. The rich blue shade of fabric is neutral enough to blend seamlessly with most colour schemes, while still providing an updated take on the usual brown and black options. Bring some classic colour into your dining space with the sophisticated Tinga dining chair. The rich beige shade catches the eye while still being neutral enough to work with almost any dicor. Rubber wood construction and a webbing seat structure ensure this durable chair will stand up well to regular use. Sit and enjoy a meal in cushioned comfort on the padded seats and backs, which are covered in an easy-to-clean 100% polyester fabric. Traditional tufted accents on the seatback complement the gently rolled top, adding to the elegant look. Complete a unified look in your dining room with multiple Tinga chairs, or place one in a study or living room for attractive additional seating as needed. Outfit your seating ensemble in timeless elegance with this stylish side chair. Its frame is crafted of solid wood. Wrapped in tufted upholstery, the seat offers up a rolled back top and a foam fill for plush appeal. Pull a few up to a glass-top dining table to build the foundation for your entertaining space, this chic chair is an eye-catching accent for the entryway or den. Decorate with the timeless and elegantly designed Leroy Dining Chair, an easy yet transformational piece that instantly takes your dining space to the next level. Perfect for upgrading an existing table, the chair offers a supportive comfortable seat, covered in a beautiful airy fabric and build on a Natural Wood frame. On its own or tucked under the table, the Leroy chair is crafted to perfection and will remain a staple in your home for years to come. 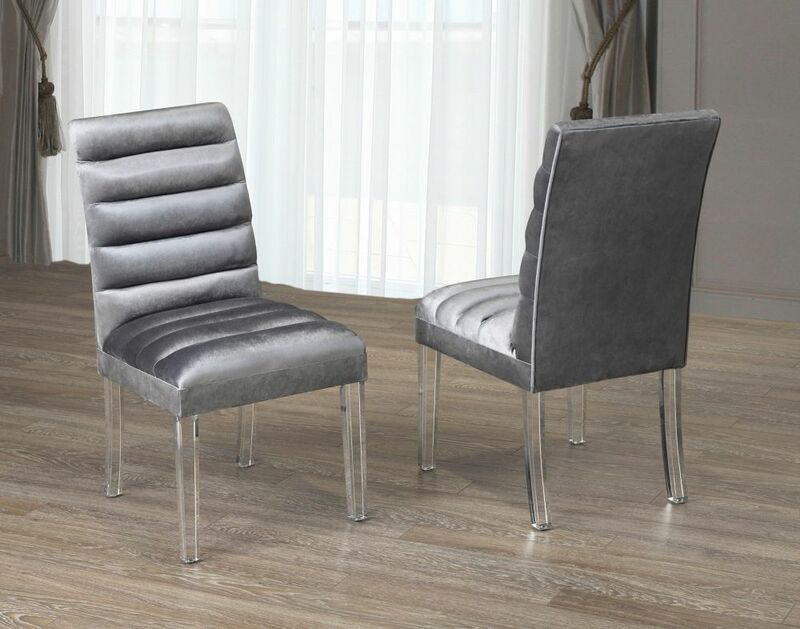 Benecio Dining Chair (Set of 2) Grey Add some drama to your dining room with the contemporary Benecio dining chair. Finished with a durable and easy-to-clean 100% polyester fabric cover, this upholstered chair has a rich, velvety feel that adds a sophisticated twist to your home furnishings. Featuring a sleek ribbed design and clear acrylic legs, this comfortable chair has a modern feel with standout style. The timeless and neutral grey colour is a fashionable way of updating any dining space and blends easily with existing decor. Group multiple Benecio dining chairs around a table to create an elegant dining set, place them individually around your home as accent pieces, or use for extra seating when entertaining. This attractive and versatile chair makes a chic addition to any living space.